As much as we love Atlanta's trees, not every tree deserves to be protected. Some trees must come down, particularly when they present a hazard of falling. Trees that pose an immediate hazard to the city's streets, other public property or an adjoining property are deemed to be Nuisance Trees and should be reported immediately since they present a significant safety risk. But what if the city arborists that you entrust to deal with nuisance trees find it too much of a nuisance to bother with them? Our examination of the field notes of the so aptly named 'Double Trouble' arborists show that this is exactly what's happening. And even though their manager is being replaced, these arborists are still on staff, so it is our duty to report what we are learning about them through our own investigation of the City's records. When a city arborist comes across a nuisance tree, he or she must force removal of the tree or abatement of the hazard. Yes, this can be a difficult and time consuming process, particularly if the property owner cannot be found or is not cooperative. But a known risk to life, limb and property cannot be ignored any more by a city arborist than a gun-wielding burglar kicking in a door can be ignored by a city police officer. City arborists are vested with the legal authority and police power to protect the citizens of Atlanta from dangerous trees, but it appears that they are not doing their job. According to city records, none of the trees documented as "nuisance trees" during the third quarter by city field arborists Stan Domengeaux and Michael Franklin were ever reported to the Office of Parks to initiate the Nuisance Tree legal procedures, which would force their removal. A recent site visit to the properties where these documented nuisance trees were reported reveal dangerous trees still standing, months after they were first noted by a city arborist. However, oddly enough, we found no evidence of a nuisance tree or its removal on several properties we visited, which suggests that these reports were made incorrectly. How could this be? All city arborists are ISA certified arborists, trained to spot a dangerous tree. And, yes, we also found one "virtual" nuisance tree on a "virtual" property, that is: a documented nuisance tree on a property that doesn't have any physical land mass. Why are these seemingly false reports being made? What is their purpose? Regardless, there are real trees out there which should come down immediately. We took pictures of them. 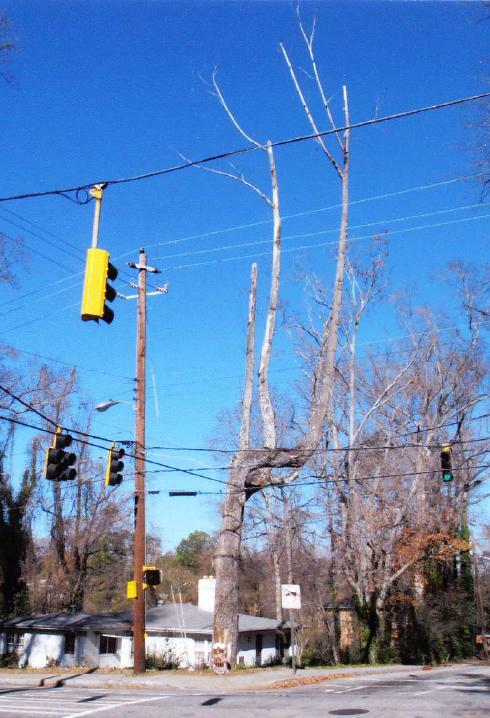 Would you like to pass by one of these trees during Atlanta's next windstorm? Probably not. But none of these trees are due to be removed anytime soon because the paperwork hasn't even begun to get them removed. Even though the City knows about them, they have simply been ignored. This failure on the part of two city arborists to do the job that we taxpayers are paying them to do is not only a waste of city funds, but leaves citizens endangered and the City exposed to expensive negligence and liability claims. We hope that the new arborist manager, once named, will exert the appropriate supervisory oversight to ensure the safety of Atlanta's citizens. Hopefully, this will happen before one of these known nuisance trees falls on someone.